Hello Internet. I have a puzzle for you. It’s quite hard. In this puzzle you have to build the brain of a bird. The brain already has several Neurons, you need to connect them with some Axons. Controls: Click on a Neuron (the grey disks), drag to a different Neuron and let the button go. This will make a wire between the two Neurons. Click on a wire to delete it. You want to make the stream of birds pass through each yellow “food”. If you get one dot then you’ve figured out how to play. If you get the second dot then you are clever indeed. The third one is genuinesly hard, I really doubt you’ll make it there so why stress about it? There are Three broad catagories of Neurons and Nine specific kinds. These correspond to the top row, the two middle rows, and the bottom row of the puzzle. The top rows generate directional input, the middle rows can change that input, and the final row takes whatever is being fed into it and steers the bird in that direction. This Neuron points towards the red baloon. But, and this is important, only if the bird is touching it. The bird is blind, it can’t see the baloon, it can only feel it. Up/Down/Left/Right: These Neurons point in one direction at all times no matter what. Try conecting one of these neurons to the final “motor neuron”. These are your basic normal Neurons. They average whatever input they get. If you pass them a down and a right you will get down-and-right out of it. This reverses whatever you pass in. If you pass it a down and a right you will get up-and-left out of it. Will average whatever input it gets and then multiply by two on the way out. If you pass it down and right you will get down-and-right-but-fast out. Will average whatever input it gets and then divide by two on the way out. If you pass it down and right you will get down-and-right-but-slow out. This is the birds wings. It will fly in whatever direction you like. If you pass it down and right then the bird will fly down and right. Wires: are used to connect Neurons. Information flows along the wires in the direction you draw them. If you draw from the Left Neuron to the Motor Neuron your birds will go left. 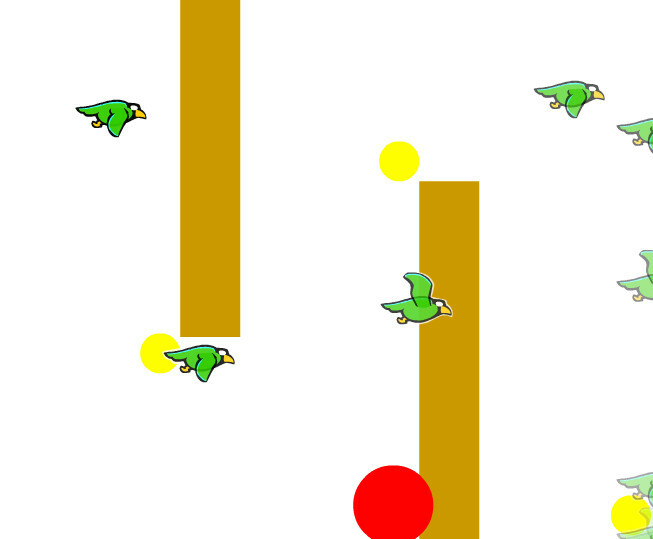 If you drag from the Motor Neuron to the Left Neuron the bird will not move. Inhibiting Wires: These wires inhibit whatever they are connected to acoriding to the strength of the information passing along them. 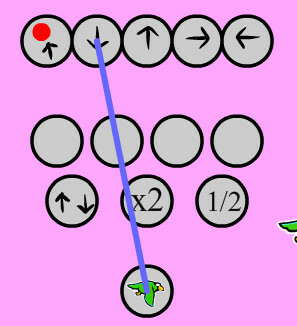 If you connect the Down Neuron to the Motor Neuron with a normal wire and then the Left Neuron to the Motor Neuron with an Inhibiting wire the bird will not move because the Motor Neuron is being inhibited with the strength of the Left Neuron. Loops: You can make loops. Overlapping Wires: You can place a wire between the same two Neurons as many times as you want going in either or both directions. There is no graphical hint to tell you how many wires are there. Special Case: Neurons average all the information they get except for the special case of zeros. If they get a zero they will simply ignore it. Since the birds can not see the Baloon when they start connecting the Balloon Neuron to anything will have no immediate effect because it is sending no information. Combining anything with no information results in no change, not a halving of the value. If you’d rather just mess about in a sandbox I have one of those here. Difficult indeed! I’ve been trying for half an hour, and I still can’t figure out how to start going up after going down for awhile. How do you turn a steady input into different outputs? Am I correct in observing that you cannot create a loop, and get some data flowing through the loop and then disconnect the loop’s inputs, but have the loop “keep going” based on earlier inputs that are still propagating through it? When I try such a thing the birds seem to stop as soon as I disconnect any input to the loop. Making any changes to the brain resets the brains of the birds currently in the world so any memories they have will be forgotten. I think of loops as memories.